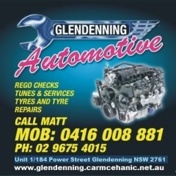 Welcome to Glendenning Automotive vehicle suspension repairs and performance upgrades for 4x4, cars, light trucks, mini bus, vans, caravan, trailers. 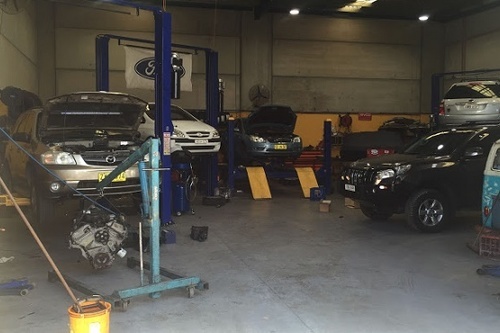 If your seeking a highly professional workshop in Glendenning western Sydney near Mt Druitt & Blacktown call us to repair all your suspension problems and enhancements, vehicle sports lowered suspension, When it comes to lowering your vehicle we only use parts from the worlds leading brands. Many rear wheel drive cars have non-independent suspension, usually at the rear. A solid axle connects the wheels on each side. When one wheel is deflected by a bump the other wheel is deflected because of the solid connection between them. This can cause stability and traction problems. Non-independent suspensions are most commonly used in four wheel drive vehicles and trucks as they can carry heavy loads and are very rugged. The independent suspension offers a more comfortable ride and better handling characteristics simply because each wheel reacts separately from the others. When the wheel on one side hits a bump there is no reaction from any other wheel. Suspensions should be checked in accordance with the manufacturer’s recommendations. There are a number of parts that are susceptible to wear particularly spring and suspension arm bushes. The springs help to keep the wheel in contact with the road are assisted by the shock absorber. Once the spring compresses it rebounds and this happens over and over, like oscillations on a screen. The shock absorber dampens this motion. The shock absorber does not absorb shocks (that’s the job of the springs), it dampens the effect of the oscillating springs. It achieves this by passing hydraulic fluid or gas between chambers. The shock absorber is a cylindrical chamber with a piston in the middle. The bottom of the shock absorber is attached to the lower suspension arm and the top is fixed to the car’s body. When the wheel hits a bump the piston moves up in the cylinder and fluid or gas passes through small valves in the piston from the top of the chamber to the bottom. When the wheel rebounds the piston moves down in the chamber and the fluid or gas moves in the opposite direction. This in effect dampens the motion of the spring and stabilises the body. The result is a comfortable ride and the wheels stay in contact with the road. The above components combine in various ways to make up the suspension system and there are two types of systems, the non-independent and independent suspension. The leaf spring is a long flat metal bar. It can be one or a number of leaves joined together. One end is attached to a pivot on the body, the centre is attached to the axle (by U-bolts) and a moving bracket (shackle) attaches the other end to the car’s body. When the wheel hits a bump in the road it moves upwards. The spring flexes and as it is fixed on one end (the pivot) the other end swings on the shackle. 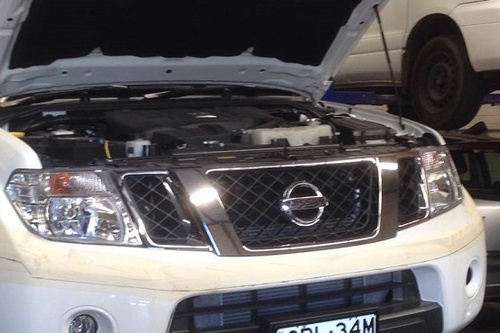 The flexing of the spring pushes the wheel downwards to keep it in contact with the road. Coil springs.The coil spring sits on the lower suspension arm, which can pivot. It is fixed at the top to the car body or cross-member. When the wheel hits a bump it is deflected upwards and this moves the lower suspension arm, which compresses the spring. The spring forces the lower suspension arm downwards and this keeps the wheel in contact with the road. Torsion bars. The torsion bar is a long round metal bar. It is attached to the lower suspension arm, which pivots and is fixed at the opposite end to the car body or chassis. When the wheel hits a bump the lower suspension arm is deflected, which causes the torsion bar to twist. It immediately resists this twisting motion and forces the wheel downwards. Sway bars dramatically improve the grip, handling and performance of your vehicle. Cornering loads are spread more evenly across the tyres delivering more grip, that's what it's all about. You also get improved tyre wear as your tyres stay flatter and more upright. Comfort improves because your car sits flatter through bends meaning less movement inside the vehicle. If you require further information contact the workshop or send a sms or email.